I started taking pictures around Chicago in the 1950s, when I was still in grade school. Things only got worse when I went to work and could afford a good camera. Going through some old slides recently, I ran across this picture. It is not a photo-shopped joke. 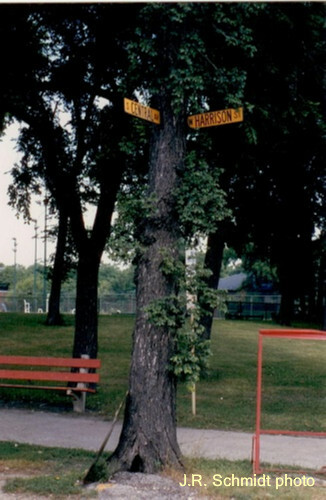 Once upon a time, the City of Chicago really did nail a couple of street signs into a tree. The location was a few feet into Columbus Park, where the busses from the Central and Harrison lines have their turn-around. I remember seeing the sign there for many years. When the city switched over to green street signs, they finally decided to invest in a pole. I don&apos;t know long the tree lasted. This was the only tree street-sign that I ever saw in Chicago. But if anybody has memories of others, let me know.